Widescreen View: View the movie in its original theatrical 2.39:1 aspect ratio. 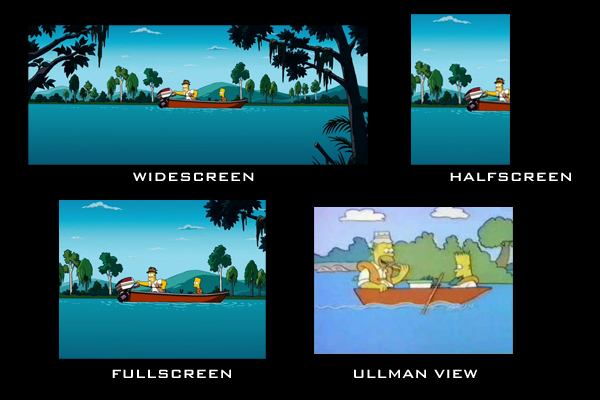 Fullscreen View: View the movie formatted to fit your screen. Halfscreen View: View the movie formatted to fit half your screen. Ullman View: Recreates the movie in the style of the original Tracey Ullman Show shorts. Animatic View: View the movie through animatic. Storyboard View: View the movie through storyboards. Participants: Alt.tv.simpsons regulars Don Del Grande and Benjamin Robinson; Webmasters Jonah Flynn, Jukka Keskiaho, Jouni Paakkinen, Eric Wirtanen and Adam Wolf; No Homers Club posters "Channel Surfer" and "DoTheBartman"
Matt Groening, director David Silverman, and a team of assistant directors and layout artists sketch directly over the movie. Director David Silverman draws dicks on all the characters. Cartoon Cabinet: Itchy consults with his cabinet, which consists of Poochie, Ku Klux Klam, Disgruntled Goat, Flatulent Fox, Uncle Ant, Dinner Dog, and Donald Rumsfeld. 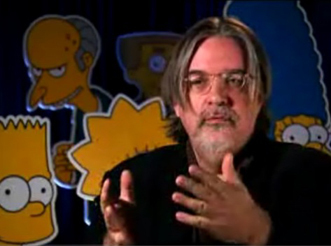 Meta-Criticism: Comic Book Guy proclaims the opening Itchy and Scratchy cartoon "Worst movie ever." Extended Opening Sequence: Lisa plays the theme from Pirates of the Carribean on the sax; the cash register displays "$75 Million" when Maggie is scanned; the Simpsons rush into the family room and discover Siskel & Ebert sitting on the couch, who give them two thumbs down. Opening Act: Ringo Starr, Paul McCartney, Bob Dylan, and Eric Clapton open for Green Day in a scene cut for time. Green Day's Say: In this scene that never made it past storyboard, the concertgoers listen to Green Day's few words about the environment and the entire crisis is averted. Grampa Almighty: God, who resembles Morgan Freeman, tells Abe to build an ark. Lovejoy's Secret: Reverend Lovejoy shows Marge footage of Abe's prophetic outburst taken by the church's secret-surveillance system ("Here's the money shot," he exclaims). Curiously, this scene was excised solely to piss off a single Lovejoy-obsessed fan on the Internet. Late Night Laughs: Krusty the Clown appears on Conan O'Brien's show. During a heated exchange, Krusty accuses Conan of "putting words in my mouth." 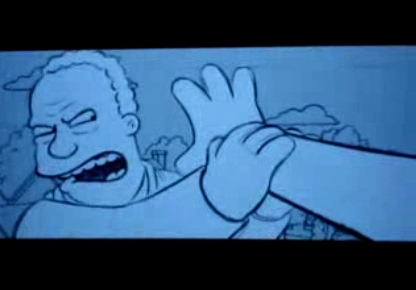 Helen's Hypocrisy: Bart skateboards past Helen Lovejoy, who exclaims, "Won't somebody please think of the children!" and then takes out a pair of binoculars to peer at Bart. Ham Chops: Homer takes the pig home and eats it. Advice from Erin: Lisa asks Erin Brockovitch (playing herself) for advice after the townspeople fail to listen to her pleas to clean up Lake Springfield. Brockovitch tells Lisa to "give it up." Hutz's Plan: At the town hall meeting, Lionel Hutz suggests everybody in the town simply "declare bankruptcy, default on our loans, and hide any remaining money in a numbered Swiss bank account" instead of doing anything about the lake. This scene uses Phil Hartman audio from a "$pringfield" deleted scene. Cash on Delivery: In a cameo role, Rupert Murdoch refuses to give Fat Tony money because the body was not properly disposed of. Dearly Departed: It is revealed that Police Officer Eddie is actually working for Fat Tony, and mobster Louie is actually working for the Springfield Police Department. Counseling: At the bequest of Flanders, Bart sees a grief counselor (played by Meryl Streep) who patronizingly tells him that Homer's bad parenting has already doomed Bart to a life of underachievement and it's too late to do anything. Ted's Visit: On the way to visit Mayor Quimby ("some distant relative, or something"), Ted Kennedy accidentally drives into Lake Springfield and mutates into a gelatinous blob. Blinky's Farewell: The infamous three-eyed fish is eaten by the mutated squirrel, who then spouts five more eyes. Lost in the Woodsy: An EPA official brings the mutated squirrel to EPA chief Russ Cargill, which then attacks a guy in an owl costume. Hey Arnold! : A scene explaining how Austrian-born Arnold Schwarzenegger became president: by convincing voters he is from Peoria. Mystery Solved: President Schwarzenegger asks which state Springfield is in, to which Cargill replies, "Kansas." Disco Fever: Observing the dome being placed over the town, Disco Stu says, "Looks like Disco Stu is Disco Doomed!" A bystander says, "That was terrible!" and then gets crushed by the dome. Life in Hell: Making a cameo appearance, gay lovers Akbar & Jeff are separated as the dome closes in. Akbar exclaims, "Boy, love really *is* hell!" Fast Track: The "Just Stamp The Ticket" Guy attempts to leave Springfield via train, but an elderly ticket teller fails to stamp his ticket in time. The Perfect Plan: Lester and Eliza (from "The Day The Violence Died") discover a way to escape the dome, but are trampled by Stampy before they can tell anyone. Potty Mouth: During the mob scene, Dr. Hibbert holds up a mutated squirrel and declares, "I want these motherfucking squirrels out of my motherfucking lake!" The Wrong Guy: Mistaking him for Homer, the townspeople accidentally hang Peter Griffin from Family Guy. Rebound: Lisa is distraught when she sees Colin holding hands with Allison Taylor ("Lisa's Rival"). Freak Show: At the carnival, the family looks into a funhouse mirror, which reflects their Tracey Ullman Show-era appearance. 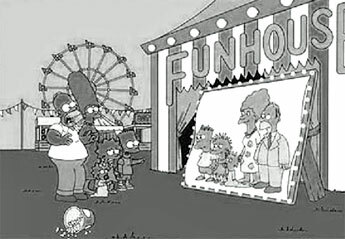 Carnival Knowledge: The word "FORESHADOWING" blinks on the screen several times as Homer rides the motorcycle at the carnival. I Now Pronounce You Carl and Lenny: In an excised subplot, Homer's co-workers pretend to be gay to get civil union benefits. Gumble's Gamble: Barney drinks a lot of beer and belches really loudly. Capital Remission: Sideshow Bob is in the electric chair, but manages to escape death when the power goes out. Oscar Wild: In Alaska, the Simpsons watch the Oscars. After The Contrabulous Fabtraption of Professor Horation Hufnagel fails to win Best Picture, Homer proclaims that the judges are just "a bunch of old Jewish socialist queers." Lisa looks at the camera and says, "Except for ones who judge the Best Animated Feature category!" and winks. But Hanks: Tom Hanks introduces himself with, "Hi, I'm Tom Hanks. You might remember me from such as films as Forrest Gump and Saving Private Ryan." Sausages Truck: Homer hides in the back of a sausages truck and eats sausages. Presidential Praise: President Schwarzenegger tells Cargill, "You're doin' a heckuva job, Cargy." Spider-Pig's Fate: Spider-Pig is elected Emperor of Springfield. The Deadliest Hallow: In the final showdown, Homer defeats Russ Cargill via a technicality involving the Elder Wand. Midnight Confessions: Smithers confesses his love for Mr. Burns, exclaiming "I wish I could quit you." Mr. Burns does not hear him because he is temporarily dead. More Than Meets The Eye: During an acid trip, Otto sees the school bus transform into a Decepticon. Alternate Ending: Cargill gets disposed of in a way that isn't idiotic. 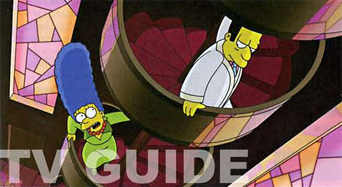 It Stinks: Kang and Kodos criticize the movie and discuss the plot holes over the end credits. Everybody's A Critic: The characters from Futurama critique Kang and Kodos's critiquing.